Camping Bungalows Altomira is located between 2 natural parks: Espadán and Calderona, in the heart of Alto Palancia. 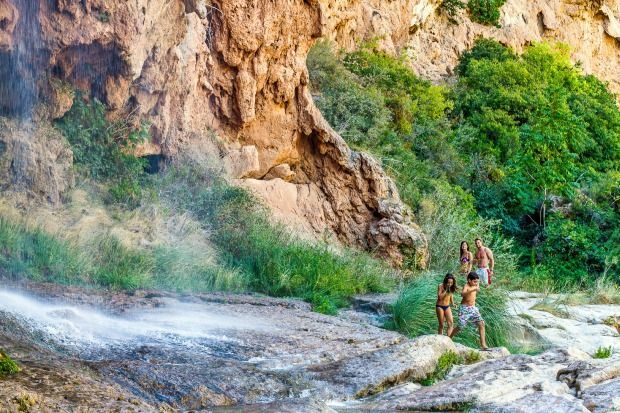 At 35 km from the Mediterranean Sea and 40 minutes from Valencia, it is a quiet and ideal place to enjoy nature. There is direct access to the Ojos Negros Greenway, a route with more than 65km. of trails to walk, bike or horseback. It is the longest road in Spain. We have 22 cabins for rent throughout the year, with capacity for 5 and 6 people. They are fully equipped: bathroom: WC, washbasin and shower. Full kitchen (hob with two gas hobs, microwave, refrigerator, cutlery, crockery and kitchenware). Hot water, heating-air conditioning, TV and covered terrace with table and chairs, you should only bring sheets and towels. And all this in an unbeatable environment for you to enjoy your free time. Throughout the year you can enjoy a cafeteria, restaurant, laundry service, supermarket in reception, WIFI Internet, living room with TV, public telephone, barbecue area, children's play area ... and in the summer months the pool and the animation are essential. Possibility of renting bicycles and doing multi-adventure activities. Option to hire, breakfast, half board or full board.